In this blog we'll cover the activities from Kourou from once the spacecraft has left the clean room in Toulouse until launch. The main goal of the Gaia mission is to make the largest, most precise three-dimensional map of our Galaxy by surveying an unprecedented one per cent of its population of 100 billion stars. During the mapping, Gaia will detect and very accurately measure the motion of each star in its orbit around the centre of the Galaxy. Much of this motion was imparted upon each star during its birth and studying it allows astronomers to peer back in time, to when the Galaxy was first forming. By constructing a detailed map of the stars, Gaia will provide a crucial tool to study the formation of our Galaxy, the Milky Way. While surveying the sky, Gaia is bound to make many other discoveries. During its anticipated lifetime of five years, Gaia will observe each of its one billion sources about 70 times, resulting in a record of the brightness and position of each source over time. Together with the unprecedented accuracy of the astrometric measurements, this will lead to the discovery of: planets around other stars, asteroids in our Solar System, icy bodies in the outer Solar System, brown dwarfs, and far-distant supernovae and quasars. The list of Gaia's potential discoveries makes the mission unique in scope and scientific return. Huge databases of information will be compiled from the Gaia data, allowing astronomers to trawl the archives looking for similar celestial objects or events and other correlations that might just provide the clue necessary to solve their particular, seemingly intractable, scientific puzzle. The Gaia spacecraft is comprised of a payload module, a mechanical service module and an electrical service module and has a launch mass of around 2 tonnes. The payload module is built around the hexagonal optical bench (~3m diameter) which provides the structural support for the single integrated instrument that comprises three functions: astrometry, photometry and spectrometry. It further contains all necessary electronics for managing the instrument operation and processing the raw data. The mechanical service module comprises all mechanical, structural and thermal elements supporting the instrument and the spacecraft electronics. It also includes the micro-propulsion system, deployable sunshield, payload thermal tent, solar arrays and harness. The electrical service module offers support functions to the Gaia payload and spacecraft for pointing, electrical power control and distribution, central data management and radio communications with the Earth. Gaia will be placed in an orbit around the Sun, at the second Lagrange point L2, which is named after its discoverer, Joseph Louis Lagrange (1736-1813). For the Sun-Earth system, the L2 point lies at a distance of 1.5 million kilometres from the Earth in the anti-Sun direction and co-rotates with the Earth in it's 1-year orbit around the Sun. One of the principal advantages of an L2 orbit is that it offers uninterrupted observations, since the Earth, Moon and Sun all lay within the orbit of the L2 point. From L2 the entire celestial sphere can be observed during the course of one year. To ensure Gaia stays at L2, the spacecraft must perform small manoeuvres every month. Gaia will not be the only ESA mission going to L2. Herschel and Planck have operated from there and currents plans call for JWST to be placed there, too. This entirely European mission was the first satellite to chart the positions of stars and produced a primary catalogue of about 118 000 stars, and a secondary catalogue, called Tycho, of over 2 million stars whose positions were determined to slightly less precision. The data is now widely used by the entire community of professional astronomers. Gaia will significantly improve on Hipparcos for a number of different reasons. For example, the collecting area of the primary mirrors means that Gaia will collect more than 30 times the light of its predecessor, allowing for more sensitive and accurate measurements. Gaia will be able to measure a star's position and motion 200 times more accurately than Hipparcos. Changes in a star's position and motion are registered as tiny angles. As a comparison, if Hipparcos could measure the angle that corresponds to the height of an astronaut standing on the Moon, Gaia will be able to measure his thumbnail! Highly efficient cameras, CCDs, will be used to record the images, so wide-angle images of many celestial objects can be obtained at the same time. Devices known as photocathodes were used on Hipparcos, which meant that the satellite could only record information from a single celestial object at a time. Astronomers will have the challenge of dealing with a flood of data when Gaia begins its work in 2013. Even after being compressed by software, the data produced by the five-year mission will fill over 30 000 CD ROMs. This data will be transmitted 'raw' and will need processing on Earth to turn it into a calibrated set of measurements that can be freely used by the astronomical community. So, not only must ESA design and build the spacecraft itself, they must also develop new computer software that will ensure the data can be processed efficiently once it is back on Earth. For stars within a distance of approximately 150 light-years from the Sun, Gaia is expected to find every Jupiter-sized planet with an orbital period of 1.5 - 9 years. It will do this by watching out for tiny wobbles in the star's position. This behaviour is caused when a star is tugged by the gravitational pull of a planet in orbit around it. In our own Solar System Jupiter, and to a lesser extent all the other planets, do this to the Sun, making it wobble. Estimates suggest that Gaia will detect between 10 000 and 50 000 planets beyond our Solar System. Gaia will detect tens of thousands of brown dwarfs, both drifting through space and in orbit around other stars, if they are there. The data is vital for astronomers to investigate how stars form, as the brown dwarfs represent the ones that did not make it. The more gas there is locked inside brown dwarfs, the less there is to make real stars. Closer to home, there is currently great scientific and public interest in detecting our Solar System's inventory of asteroids and comets. Gaia will contribute to this search because of its unprecedented sensitivity to faint, moving objects. It is expected that the spacecraft will detect tens of thousands of minor planets. Some of them will be near-Earth objects (NEOs), others will live in the 'main-belt' of asteroids between Mars and Jupiter, yet more will be located in the icy realms of the outer Solar System known as the Kuiper Belt. It is also possible that Gaia will discover 'Planet X' - if such an object exists. Ever since Pluto was discovered in 1930, a number of astronomers have believed in the existence of a tenth planet, out beyond Pluto. The hypothetical planet has been searched for many times but, obviously, not yet found. It is essential to observe such supernovae as they are still climbing in brightness. This is because the peak brightness they reach is the essential measurement for calculating their distance. Far out in space, Gaia will be in a prime location to make such observations. With the final tests and the Mission Flight Acceptance Review successfully concluded, Gaia is now ready for launch and has been assigned a launch window from 17 November to 5 December 2013. 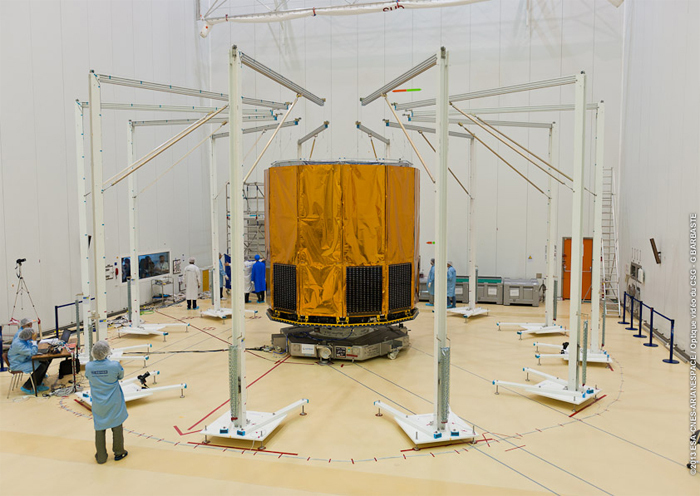 Meanwhile Gaia has been ‘switched off' and packed, and will be shipped to Kourou in the second half of August in order to prepare for its launch. Ready to go at last! 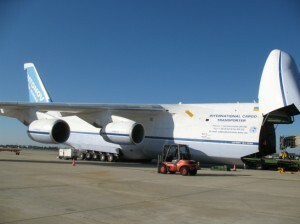 Both transports will be flown by an Antonov 124 - one of the largest aircraft in the world. ESA’s billion-star surveyor, Gaia, departed yesterday evening from Toulouse and arrived early this morning in French Guiana. Gaia will be launched later this year from Europe’s Spaceport in Kourou on a five-year mission to map the stars of the Milky Way with unprecedented precision. Built by Astrium in Toulouse, the Gaia spacecraft took off on board an Antonov 124 heavy-lift aircraft at 20.00 yesterday from Toulouse airport with the destination of Cayenne, the capital of French Guiana. 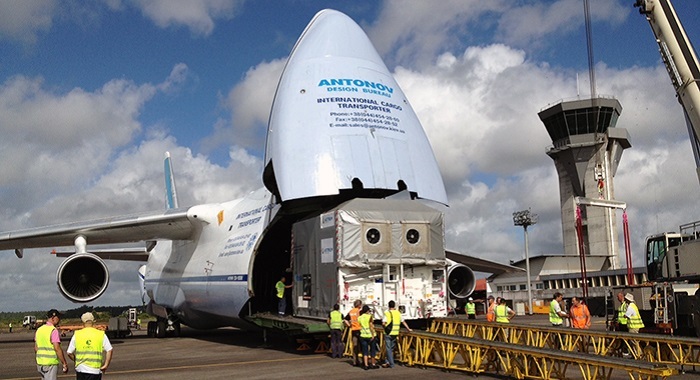 The spacecraft will now be transported by truck to Europe’s Spaceport in Kourou, 64 km from Cayenne. Gaia’s main goal is to create a highly accurate 3D map of our galaxy, the Milky Way, by repeatedly observing a billion stars to determine their precise positions in space and their motions through it. A billion stars is roughly 1% of all the stars spread across the Milky Way, providing a representative sample from which the properties of the whole galaxy can be measured. Gaia will measure these stars from an orbit around the Sun, near a location known as the L2 Lagrangian point, some 1.5 million km beyond Earth’s orbit. Gaia will also uncover tens of thousands of previously unseen objects, including asteroids in our Solar System, planets around nearby stars, and exploding stars – supernovae – in other galaxies. On 28 August, a second Antonov 124 aircraft will carry Gaia’s sunshield and most of the ground support equipment from Toulouse to Cayenne. 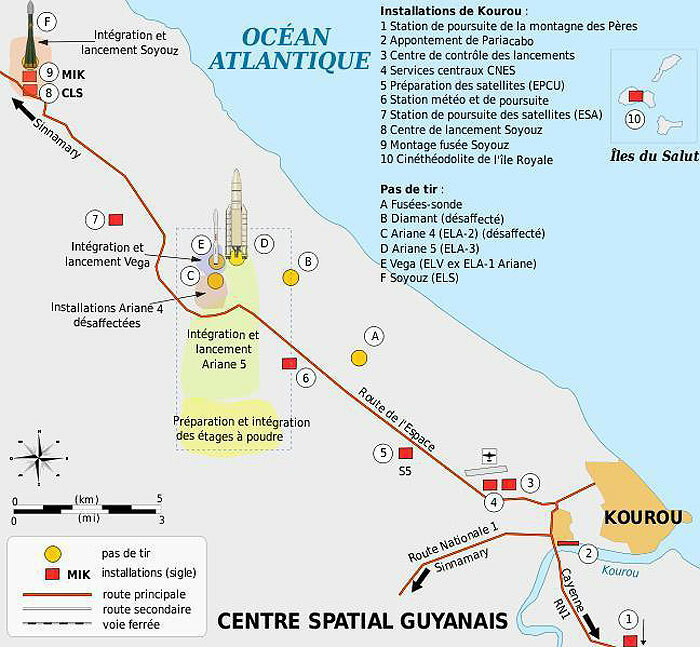 At that point, all the spacecraft parts and equipment will have arrived in French Guiana, leading towards the launch later this year. The largest digital camera ever built for a space mission has been painstakingly mosaicked together from 106 separate electronic detectors. The resulting ‘billion-pixel array’ will serve as the super-sensitive ‘eye’ of the European Space Agency (ESA) galaxy-mapping Gaia mission. At its Toulouse site, Astrium is making final adjustments to the scientific instruments for the Gaia satellite, which from 2013 will start mapping more than a billion stars in the Milky Way. As well as drawing up a 3D map of our galaxy, this mission will also verify Einstein’s general theory of relativity with greater precision than ever before. In mid-September, Vincent Poinsignon witnessed the culmination of years of work. He had before him the largest digital camera ever built, with a total of a billion pixels. Vincent, who heads up the Gaia project at Astrium, maintains that from the Earth this camera could have measured a freckle on Neil Armstrong’s face as he took his first steps on the moon. 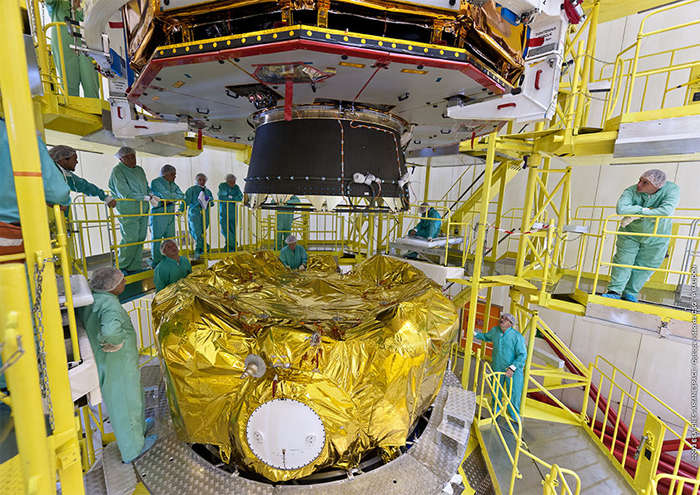 The camera has now been integrated in the payload module of the Gaia satellite, built by Astrium for ESA, and is being tested in Astrium’s cleanroom facility in Toulouse. In late 2013, it will be launched from the European Spaceport in French Guiana and placed in orbit to assume its role as the most powerful ‘eye’ ever to observe the Milky Way.“In astrometric terms, Gaia will have a precision 100 to 1,000 times greater than its predecessor Hipparcos,” explains Vincent. When ESA launched Hipparcos in August 1989 it was the first satellite devoted to astrometry, a branch of astronomy involving measurement of the position and movements of celestial bodies as well as their distance from the Earth. Up until its ‘retirement’ in 1993, it amassed a catalogue of 120,000 stars with a precision 200 times greater than any other previous measurements. Now, Gaia’s eagle eye makes Hipparcos seem as blind as a bat. Once in orbit around the sun, the new satellite will begin to precisely measure the characteristics of a billion stars which will then be used to generate a 3D chart of our galaxy. 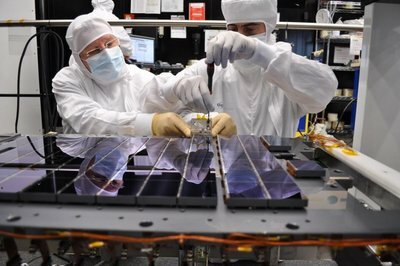 This sensitivity will enable it to detect more than 250,000 objects in our solar system (mostly asteroids), 15,000 extrasolar planets, 50,000 brown dwarfs and around 20,000 supernovae. Gaia’s exceptional capabilities have come about through years of work by a team of over 500 people at Astrium, explains Vincent Poinsignon, who was previously project manager for Mars Express, the first European mission to the Red Planet. Gaia contains two telescopes which in combination are powerful enough to detect stars 400,000 times fainter than the human eye can see. The weak light of these celestial bodies is captured on a focal plane the two telescopes share, which consists of 106 charge-coupled devices (CCDs), an advanced version of the chips in standard digital cameras. A key feature of the CCD support structure and the rest of the satellite is the use of silicon carbide, a material with ceramic properties originally developed as a diamond substitute which is incredibly light and resistant to deforming under temperature changes. Astrium has already used this material on other satellites, including the Herschel space observatory launched in 2009. The 3.5-metre mirror of Herschel’s large telescope, made entirely of silicon carbide, weighs a mere 270 kilograms compared to the 1,500 kilograms it would have weighed using standard technology. Now the use of silicon carbide will enable Gaia to function at temperatures of -110°C to increase the sensitivity of its sensors. A deployable sunshield with a length of around 10 metres will keep its instruments in the shade at all times to protect them from the sun’s heat. “Gaia’s innovations include the micropropulsion system and the antenna, along with the generalised use of silicon carbide not only for the telescope mirrors but also for many parts of the payload module,” highlights Timo Prusti, Gaia Project Scientist at ESA. As Timo indicates, the antenna plays a vital role. The satellite will detect and measure the characteristics of hundreds of stars per second practically uninterrupted during its five-year mission. Each star will be monitored around 70 times with a precision “that could divide the moon into 180 million slices from the Earth”, he says. Every day, Gaia’s antenna will need to send 50 gigabytes of data to the Earth over a distance of 1.5 million kilometres. At the end of the mission, scientists will have gathered one petabyte of data, equivalent to the information stored on 200,000 DVDs. Gaia is a global space astrometry mission, and a successor to the ESA Hipparcos mission. Part of ESA’s long-term scientific programme, Gaia is being built by Astrium and is expected to be launched in 2013 on a Soyuz vehicle. It will conduct a census of a billion stars in our galaxy, monitoring each of its target stars about 100 times over a five-year period, precisely charting their distances, movements, and changes in brightness. It is expected to discover hundreds of thousands of new celestial objects, such as extra-solar planets and failed stars called brown dwarfs. Within our own solar system, Gaia should also identify tens of thousands of asteroids. Additional scientific benefits include detection and characterisation of tens of thousands of extra-solar planetary systems, a comprehensive survey of objects ranging from huge numbers of minor bodies in our solar system, through galaxies in the nearby Universe, to about 10 million galaxies and 500,000 distant quasars. It will also provide stringent new tests of general relativity. The spacecraft will use the global astronomy concept successfully demonstrated on Hipparcos, also built by Astrium, which successfully mapped 100,000 stars in 1989. Gaia will be equipped with a latest-generation payload integrating the most sensitive telescope ever made. This cutting-edge technology draws on Astrium’s extensive experience particularly on silicon carbide (SiC) telescopes, used on the Herschel telescope and Aladin instrument as well as on three Earth observation satellites (Formosat, Theos and Alsat 2). Gaia’s measurement accuracy is so great that if it were on the Moon, it could measure the thumbnail of a person on Earth! Gaia will be placed in orbit around the Sun, at a distance of 1.5 million kilometres further out than Earth, at the L2 Lagrangian point of the Sun–Earth system. 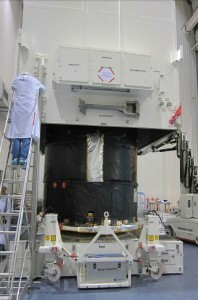 Shown in its protective shipping container, Europe’s Gaia is unloaded from the cargo jetliner that transported this advanced “star-mapper” spacecraft from Toulouse, France – where it was built by Astrium – to French Guiana. Europe’s Gaia “star-mapper” has arrived in French Guiana for an Arianespace Soyuz launch later this year on a mission to chart the locations and motions of a billion stars, while also opening opportunities in discovering new celestial objects in the hundreds of thousands. 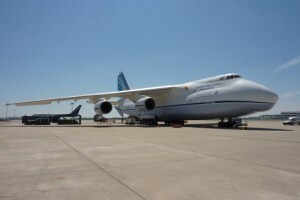 Gaia was delivered today aboard a chartered Antonov An-124 cargo jetliner at Félix Eboué International Airport near the capital city of Cayenne – clearing the way for its transfer via road to the Spaceport. With a liftoff mass of 2,030 kg. 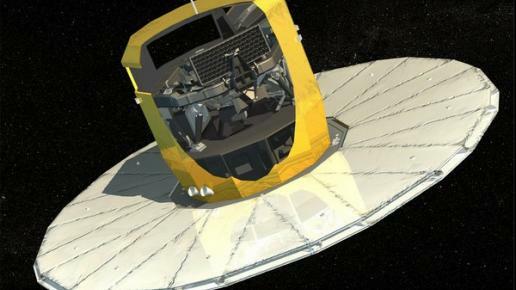 – which includes the spacecraft’s two optical telescopes, three science instruments, as well as a 10-meter deployable “skirt” as a sunshield and a power generator – Gaia will observe one billion stars approximately 70 times each over five years. Many aspects of this mission – organized by the European Space Agency – are impressive. The spacecraft carries one of the largest digital cameras to be placed in space (with nearly one billion pixels), and is designed to detect celestial objects that are a million times fainter than the unaided human eye can see. Built by Astrium at its Toulouse, France facility, Gaia will be operated by the European Space Agency to provide a representative sample from which the properties of the entire galaxy can be measured, ultimately allowing astronomers to determine its origin and evolution. Gaia’s two optical telescopes will determine star locations and velocities, splitting their light into a spectrum for analysis. The spacecraft will operate from an orbit around the Sun, at the L2 Lagrangian point located some 1.5 million kilometers beyond Earth’s orbit. During its operation, Gaia also is expected to find hundreds of thousands of new celestial objects – including asteroids, comets, extra-solar planets, brown dwarf “failed stars,” supernovae and quasars. When completed, the mission’s data archive should exceed 1 petabyte (1 million gigabytes), which is equivalent to about 200,000 DVDs worth of data. Gaia arrived today in French Guiana with a portion of its ground support equipment. 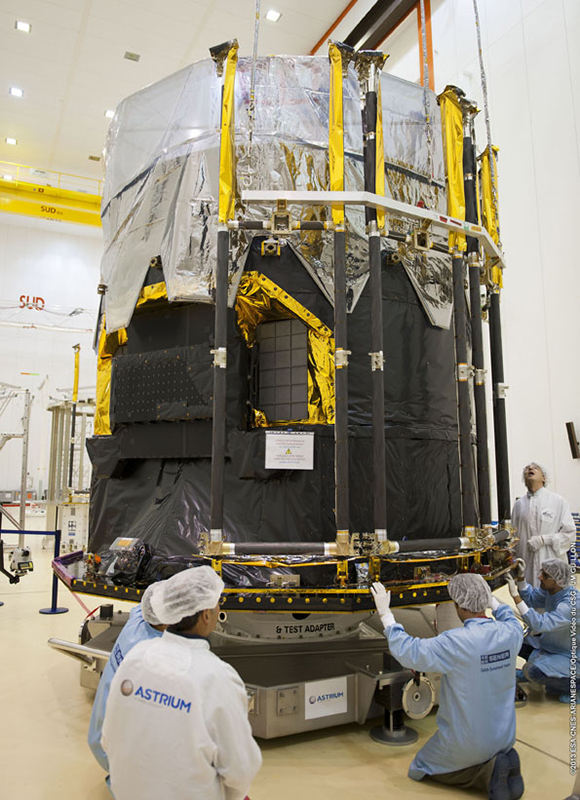 A second air cargo flight later this month is to bring Gaia’s sunshield and the remaining ground support equipment. The star-mapper has its roots in the European Space Agency’s Hipparcos space astrometry platform, lofted by Arianespace on an Ariane-series vehicle in 1989. The Soyuz mission with Gaia is designated VS07 in Arianespace’s launcher family numbering system, representing this medium-lift workhorse’s seventh flight from French Guiana. It will follow two other Arianespace launches currently in preparation at the Spaceport: Flight VA215, scheduled for August 29 with an Ariane 5 to orbit the EUTELSAT 25B/Es’hail 1 and GSAT-7 relay satellites; and VS06, targeted in late September with a Soyuz to deploy four connectivity spacecraft for O3b Networks. Gaia’s deployable sunshield framework is readied in the Spaceport’s S1C clean room facility after removal from its shipping container. Few people realize how complicated a launch actually is. Gaia is launched with a Russian-built Soyuz rocket, which has three stages. In fact, it ignites the first and second stage at the same time and the third stage is ignited before the second stage is burned out. The three main stages take the payload (spacecraft) into orbit around Earth. Then the Fregat upper stage takes over. 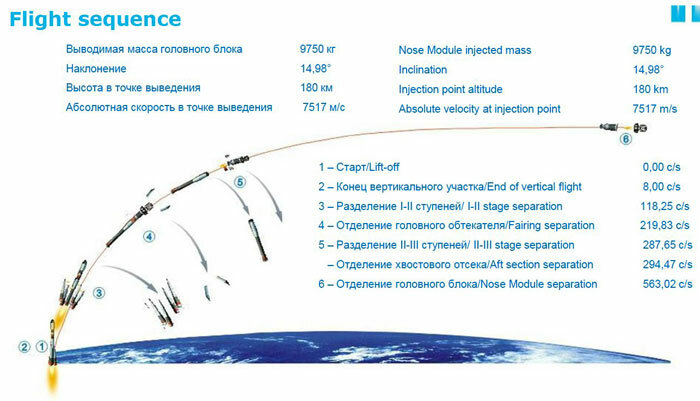 The Fregat stage is also Russian-built. With some complicated manoeuvres, it brings the satellite on course to its final destination, the L2 point. Once the Fregat has done its job, it separates from the satellite, and the satellite starts working autonomously from then on. When the satellite detects the separation from the Fregat, the first thing it will do is switch on its communication system, so the ground station can see the telemetry (data coming from the spacecraft to Earth), which is then used to judge the health of the satellite and to follow its trajectory. One of the most important next steps is to deploy the sunshield (an animation of the deployment has already been posted in this blog on August 29th). However, to do so, the satellite first needs to face the Sun with its sun shield side, so the optical instrument is in the shade. The instrument is designed to measure the very weak light coming from very faint stars, so an abundant flood of direct sunlight will damage the instrument. Orientating the spacecraft is done with the CPS, the Chemical Propulsion System. There are in total 16 thrusters on board, which are then used individually or in combination with each other. 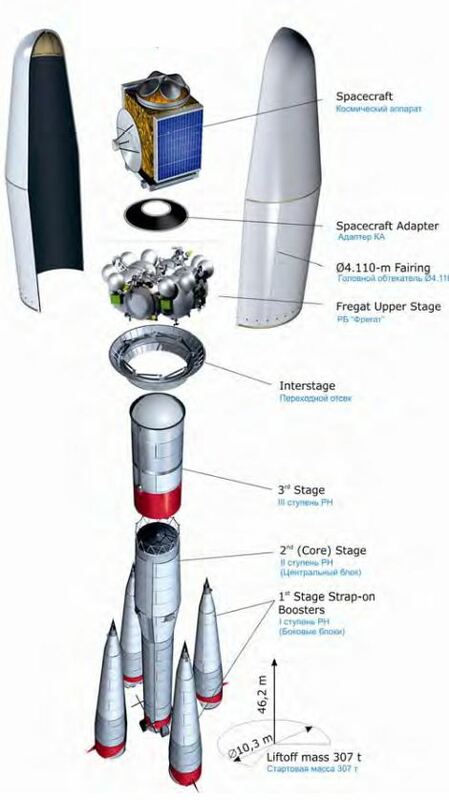 However, before they can be used, they need to be "primed", meaning leftover air from Earth's atmosphere needs to be vented from the pipework, fuel tanks needs to be pressurized, and the propellant needs to be guided to the individual thrusters in a safe way. Only then, when the CPS is ready, will the on board computer re-orientate the satellite, with the aid of its on board sun sensors and gyroscopes. All this, from lift off until deployment, is done automatically. It is all pre-programmed and no manual intervention is possible or needed. The launcher (Soyuz and Fregat) is delivered with its own flight program, under responsibility of the Russian authorities. The Gaia project team is responsible for all the autonomous operations that the satellite has to do. Since this is such a critical phase for the whole mission, this is one of the most important tests to do on ground before launch, the so-called LAM test (Launch & initial Acquisition Mode). This test was successfully run last Saturday morning. Although part was simulated (e.g. the sunshield is not mounted yet), it was proven that all the steps are programmed correctly and executed at the right time in the right order. We're again one step closer to launch! Team members from SENER and Astrium oversee the installation of Gaia’s sunshield framework on the hexagonal/conical-shaped spacecraft at the Spaceport in French Guiana. A high-tech sunshield to protect the Gaia spacecraft during its deep space mission is now being installed at the Spaceport as preparations continue for Arianespace’s Flight VS06 Soyuz launch of the billion-star mapper from French Guiana. In activity at the Spaceport’s S1B clean room facility, the carbon-fiber reinforced composite framework for this deployable skirt-like system has been positioned around Gaia. It clears the way for integration of the sunshield’s two parallel multi-layer insulation blankets over the next several days. 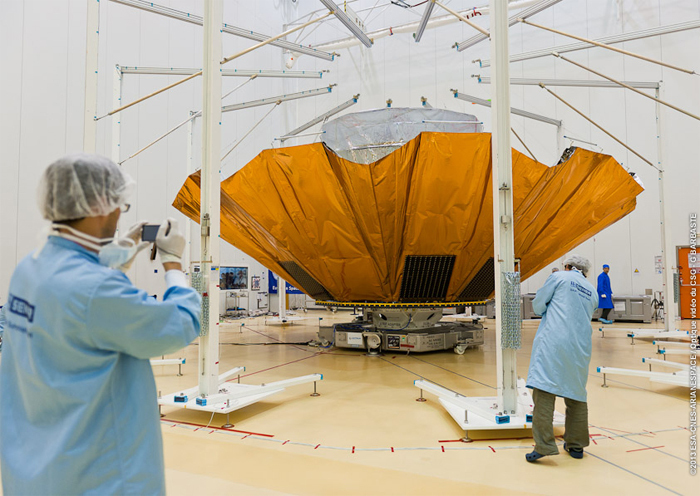 Gaia’s sunshield performs an essential role: keeping the spacecraft in shadow, and thereby maintaining its scientific instruments at a constant temperature of approximately –110°C. 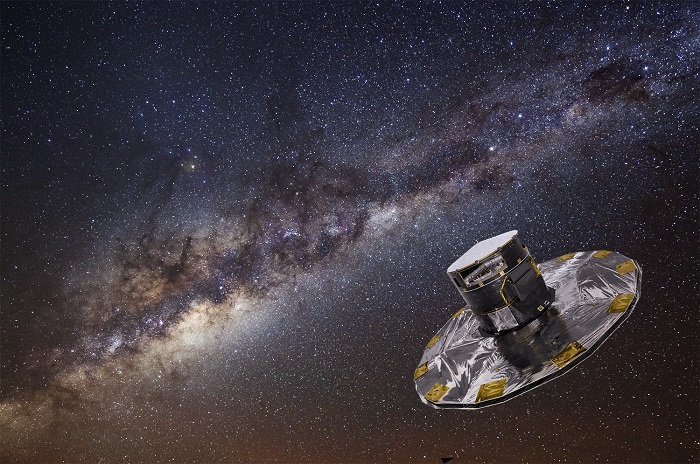 This will enable Gaia to perform its ambitious mission of making the largest, most precise three-dimensional map of the Milky Way by surveying an unprecedented one percent of its 100 billion stars. Also expected are discoveries of hundreds of thousands of unknown celestial objects, including extra-solar planets and failed stars known as brown dwarfs. With a deployed sunshield size of some 10 meters across and an area of approximately 75 square meters, the system is composed of a dozen folding panels that will rotate outward from the hexagonal/conical-shaped Gaia to their opened position after the Soyuz launch. The sunshield was produced by Spain’s SENER, while the spacecraft’s designer and builder is Astrium – all operating under contract to the European Space Agency, which is responsible for the Gaia mission’s development and operation. After Gaia’s launch by Arianespace, the spacecraft will be placed in an orbit around the Sun at the second Lagrange point (L2) – a distance of 1.5 million kilometers from the Earth. Flight VS06 is Arianespace’s sixth Soyuz launch at the Spaceport – and the medium-lift launcher’s first deep-space mission from French Guiana. Liftoff is scheduled for November 20. The 12 frames of Gaia’s sunshield are hinged on the spacecraft at its base, and they open 90 degrees. 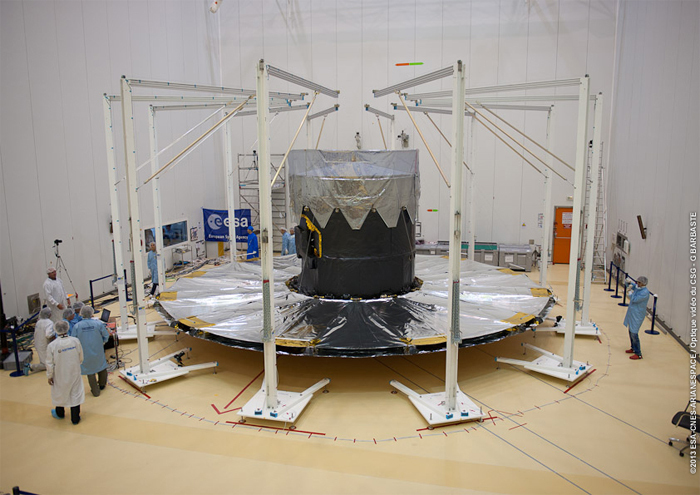 When all thermal blankets are integrated on the framework, the sunshield will form a flat disc at the base of the spacecraft, with a diameter of just over 10 meters. During activity in the Spaceport’s S1B clean room facility (pictured at right, from top to bottom), Gaia’s completed sunshield – which is composed of a carbon-fiber reinforced composite framework with thermal blankets covering the structural skeleton – was lowered around the spacecraft’s base, forming a flat disc more than 10 meters across. Aufgrund kürzlich entdeckter technischer Probleme hat die ESA beschlossen, zusätzliche Überprüfungen von Satellit Gaia durchzuführen, und deshalb gefordert, dass Arianespace den Start von Gaia verschiebt, der derzeit für 20 November geplant war. Ein neuer Starttermin wird, sobald die Verfügbarkeit des Satelliten bestätigt wird bekannt gegeben. Seit Monaten absolvieren die etwa 60 Ingenieure des Gaia Mission Control Teams ein intensives Simulationstraining, das jeden Aspekt der ersten Mission der Raumsonde zum 1,5 Millionen Kilometer von der Erde entfernten Lagrange-Punkt L2 umfasst. Das Training, das oft 12 Stunden am Stück dauert, findet im Hauptkontrollraum des Europäischen Satellitenkontrollzentrums (ESOC) in Darmstadt statt. In Simulationen bedienen die Ingenieure das tatsächliche Missionskontrollsystem, um eine realitätsgetreue Software-Replikation der echten Gaia zu steuern und zu fliegen. Diese Replikation reagiert genau so auf die Befehle wie die echte Software. „Es sieht vielleicht wie ein riesiges Videospiel aus, aber das Training ist viel komplexer und anspruchsvoller – und so soll es auch sein. Wir wollen sichergehen, dass die Teams schnell auf jedwede Eventualitäten reagieren können", sagt Michael Gabel von der ESA, der Verantwortliche für das Training am ESOC. Das Training wird von einem wenig bekannten Team aus ESA- und Branchenspezialisten überwacht, das in einem zugangsbeschränkten Simulationsraum unter dem Hauptkontrollraum arbeitet. Während der Trainingsreihe speisen die Trainer eine gezielt strukturierte Reihe von Störungen, Fehlern und Ausfällen in die Raumsonde bzw. die Software und die Systeme ein, die Gaia fliegen sollen. Unter der Aufsicht des Flugleiters (Flight Director) über ihnen müssen die Missionscontroller an den Geräten das Problem erkennen, bewerten und daraufhin den entsprechenden Notfallplan anwenden. In früheren Phasen der Trainingsreihe waren Fehler einfacherer Art eingestreut worden. „Nun, da der Zeitpunkt des Starts immer näher rückt, simulieren wir die Ankunft Gaias am L2. Neben der LEOP-Phase ist dies wahrscheinlich die risikoreichste und sicherlich die kritischste Phase bei jeder Mission. „Wir setzen multiple, komplexe Störungen ein. Wir versuchen wirklich, das Kontrollteam unter Druck zu setzen, um zu testen, ob sie wissen, was sie tun. Um Lösungen zu finden, müssen sie als Team zusammenarbeiten“, so Joe Bush von Telespazio VEGA Deutschland, der für die Gaia-Simulationen verantwortlich ist. LEOP umfasst die Trennung vom Startgerät, das Ausrichten der Solarmodule und das Empfangen der ersten Signale des Satelliten. Der Start von Gaia ist in naher Zukunft geplant. Der Satellit wird den Lagrange-Punkt 2 nach 21 Tagen Flugzeit erreichen. To allow the Gaia program to carry out additional checks on its satellite, Arianespace has switched the order of its two upcoming launches, with full agreement of its customers, moving the Ariane 5 ECA mission for SES and Hispasat ahead of the Soyuz launch for ESA. Evry, November 22, 2013. The checks on the Gaia satellite are proceeding nominally, enabling Arianespace in agreement with ESA to announce the launch date. Three months before the start of the launch campaign we had to define the logo to be put on the launcher fairing, to ensure it would be ready for launch. 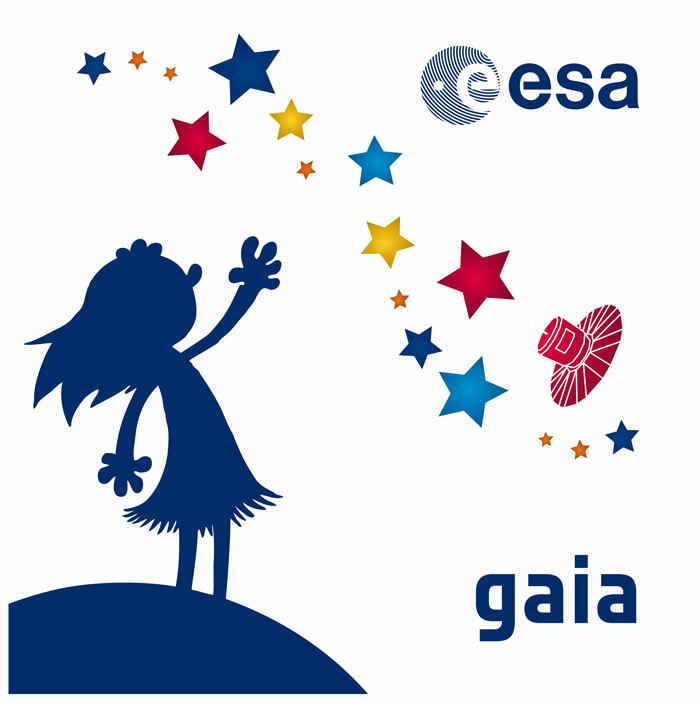 Earlier this year we had already put in place the main characteristics of the Gaia logo: stars, Earth, spacecraft, the Gaia goddess and Gaia name. But one of the main themes we wanted to represent is humankind’s curiosity towards the Universe. Quickly, different options were ready. Christophe, our graphic designer at ESTEC, came up with a very nice representation of the Milky Way. Elizabeth, from Toulouse, suggested that the girl staring at the sky should be trying to reach it. However, the presentation of the girl, the Gaia goddess linking Earth with the sky and stars, was difficult. Several options were proposed but it was difficult to get everyone to agree. Having recently seen the final work of Joël Schopfer (the nephew of Ared) finishing graphic art studies in Switzerland, we informed him of this issue. Joël is a fan of all sorts of things related to space and was very enthusiastic to contribute his ideas. When he presented his proposal it was clear that this was the one we would go for. After scrutiny and agreement inside ESA, here we are in the space centre at Kourou, soon ready for launch with a superb logo for our fairing, measuring 3.5m x 3.5m! We also have smaller sizes and it even appears on flags at the entrance of the base and next to the building where Gaia is located. Last week it also appeared on T-shirts. Thanks to all those who helped to solve one of the numerous issues that Gaia encountered during its life on Earth. Soyuz’ Block I third stage is mated to the Russian launcher in the Spaceport’s MIK integration building for Arianespace’s Gaia mission. The Soyuz launcher for an ambitious mission of developing the Milky Way’s most precise three-dimensional map is completing its basic build-up following mating of the vehicle’s Block I third stage in French Guiana. This step occurred in the Spaceport’s MIK Launcher Integration Building, enabling checkout of the integrated Soyuz prior to its upcoming transfer to the launch pad – where the European Space Agency’s Gaia star-mapper satellite and Fregat upper stage will be installed. Scheduled for liftoff on December 19, the mission – designated Soyuz Flight VS06 – will be Arianespace’s sixth with the workhorse Russian-built launcher from French Guiana since its service entry at the Spaceport in October 2011. Gaia will make the largest three-dimensional map of the Milky Way by surveying an unprecedented one percent of its 100 billion stars. The Astrium-built spacecraft also is expected to discover hundreds of thousands of unknown celestial objects, including extra-solar planets and failed stars known as brown dwarfs. In this photo sequence in the Spaceport’s S3B facility, the Gaia star-mapper is lowered into position atop the Fregat upper stage for Soyuz. The payload “stack” is now taking shape for this month’s Arianespace launch of Gaia – Europe’s billion-star mapper satellite, which is to be lofted by a Soyuz vehicle on December 19 from French Guiana. 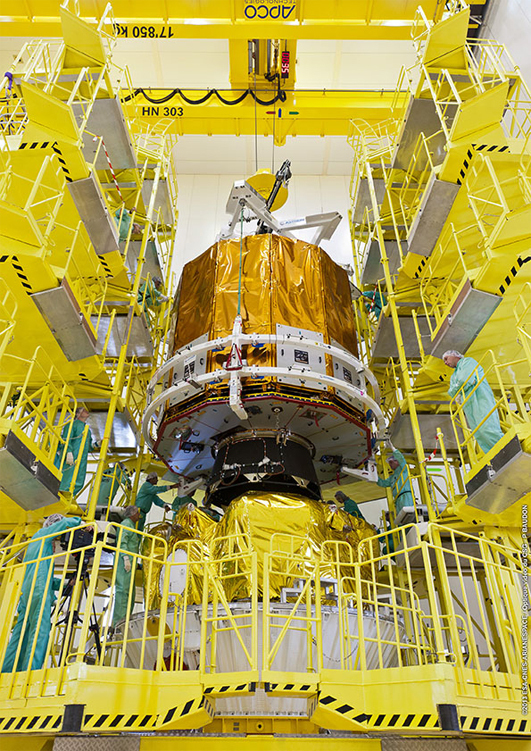 As the latest milestone in a now well-established processing flow for Arianespace’s medium-lift Soyuz, Gaia was positioned atop the launcher’s Fregat upper stage during activity in the Spaceport’s S3B preparation building. Fregat is an autonomous, highly flexible upper stage that will perform two separate burns in sending Gaia on its way to an orbit around the Sun at the L2 Lagrangian point. 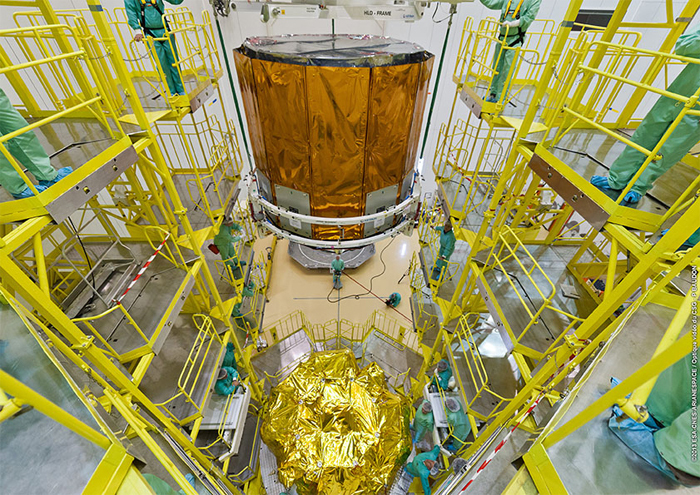 The next processing step is to encapsulate the Gaia/Fregat combination in a two-piece payload fairing, readying the unit for mating to Soyuz after the vehicle’s rollout from its separate MIK integration building – where the Russian-built launcher was assembled. Gaia is designed to observe one billion stars in the Milky Way approximately 70 times each during a mission design life of 5.5 years, and has a liftoff mass of 2,030 kg. Built by Astrium at its Toulouse, France facility, Gaia will be operated by the European Space Agency to provide a representative sample from which properties of the entire galaxy can be measured, ultimately allowing astronomers to determine its origin and evolution. Gaia will be launched on Arianespace’s sixth Soyuz flight performed from the Spaceport since 2011, where this workhorse launcher is operational alongside the company’s heavy-lift Ariane 5 and lightweight Vega vehicles. 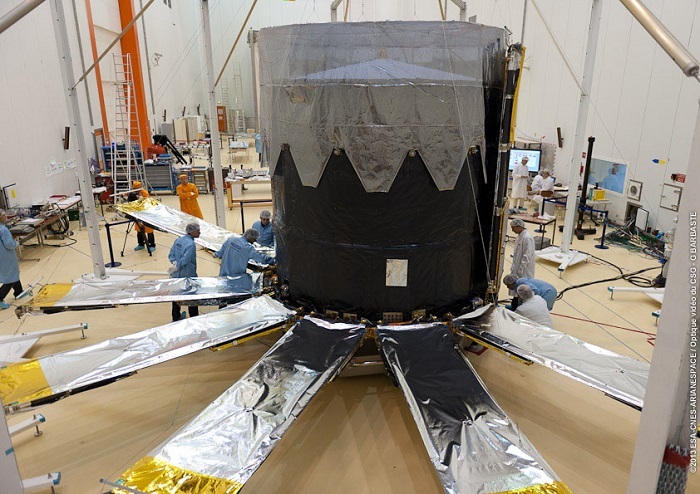 ESA’s billion-star surveyor Gaia, less than a week from launch, is now tucked up inside the fairing that will protect it during the first few minutes of ascent into space.